This quiz is part of the first unit of the course. The text of two examples quizzes is below, and of course you would want to change the questions and answers to reflect the policies and important points of your own course. 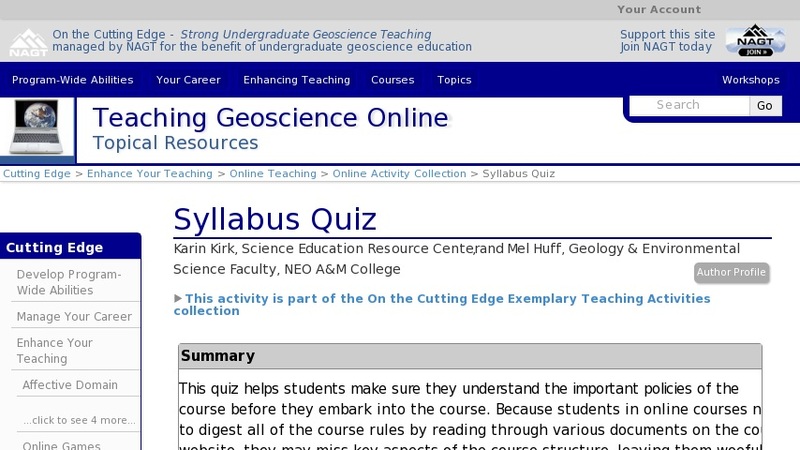 Show an example quiz Hide Self Test: Course Guidelines Correct answers are in italics. Attendance in this course is optional required three times a week required once per week required once per module Attendance does not count toward the grade counts for 10% of the overall course grade The most valuable part of the course in terms of point value is written assignments discussions final project You may contact me by sending a private message using the course email using private email using Skype arranging a time to talk on the phone all of the above Answers to the written questions at the end of each module should be based on the textbook only can be answered by pasting in text from Wikipedia can be answered with information from a combination of the textbook and credible web sites Pasting in text from a web site to answer written questions is a great time-saver OK if it's from a credible or a recommended site allowed if you give credit to the author explicitly not allowed, and will result in zero points being awarded Answering written questions using text that is verbatim (or nearly so) from the textbook is helpful if it answers the question exactly OK if you put quotations around the text explicitly not allowed, and will result in zero points being awarded True or false: Answers to written assignment questions have to be composed entirely in your own words. True False If you use information (not exact text) from the textbook or web sites to answer written assignment questions, you need to be thankful that you found the answers give the URL of the website and the page number from the textbook The best way to earn a high grade in the discussions is to post a lot write posts that contain relevant content post something you think the instructor will agree with Writing a discussion post that is based on your opinion can be a good way to jump into the discussion is especially relevant if you have direct personal or professional experience with the topic is not worth as many points as a more substantive post that you researched from other sources should not be the only type of post you make all of the above If you don't like science you should suffer through this course and hope for a C try to change your personality so that you do like science understand that even though this is a science course, it mostly deals with aspects of everyday life that most people find to be quite interesting Show another example quiz Hide Example Syllabus Quiz Mel Huff, Geology & Environmental Science Faculty, NEO A&M College Correct answers are in italics. Feel free to change the answers to fit your particular course. In addition, I change the questions from semester to semester if the previous class had struggled understanding or remembering part of the syllabus. These questions are the ones that I repeatedly get asked throughout each semester, even though the answers are stated in the syllabus as well as other locations in the course. 1. How often should you log into this class? Once a month or less Never At least once per week Every few weeks or so 2. I will be able to turn in late homework. True False 3. I will be able to make up an exam. True False 4. I have to pass lab to pass the class. True False 5. How will exams be taken? Via D2L We don't have exams in this class proctored 6. I don't have to respond to EVERY discussion True False 7. How will labs occur? (select all that apply) We don't have labs for this class We will meet during 2 Saturday sessions to do labs Lab is optional for this class I will download instructions and do labs on my own 8. What is the purpose of the tentative schedule listed at the end of the Syllabus? To keep me on track for finishing the course So that I have an idea of what we will be covering I have no idea It has no purpose 9. Which of the following will you be able to drop one of? (select all that apply) homework lab discussion response exam (I also add in a few short answer responses and have them name some things that are environmentally friendly or geological in nature (depending on the course) just to get them thinking about the class.) Teaching Tips Adaptations that allow this activity to be successful in an online environment This assignment replaces the first day of class when you jump up and down and reiterate how important it is that students know the course policies. Elements of this activity that are most effective The effectiveness of a syllabus quiz depends on the students' abilities to remember information and pick out what is important. I have used my quiz for several years. For the most part, I believe it is very effective (even in a face 2 face class) as it forces students to focus on the points I have deemed most important. That said, I still get a few students asking if they can make up an exam, for example. When I remind them about the rules in the syllabus, generally their response is that they have a hard time remember what rules/syllabus go with each course. It is my opinion that students in an online course know and remember the rules a lot better. Recommendations for other faculty adapting this activity to their own course: Obviously you can adapt this quiz to the particulars of your own course. I change the questions from semester to semester if the previous class had struggled understanding or remembering part of the syllabus. These questions are the ones that I repeatedly get asked throughout each semester, or ones that students get surprised by.